Presented in a question-and-answer format with all new cases, this new edition of a bestselling book provides a broad overview of small animal soft tissue surgery. Clinical cases appear in random order to simulate the way they might appear in an actual veterinary practice. Cases include photos, a description of presenting symptoms, and questions the veterinarian must answer in order to arrive at the correct diagnosis and to plan proper treatment. Complete answers are provided for each question. This practical structure with integrated questions, illustrations, and detailed explanations is designed to educate as well as to provide answers. 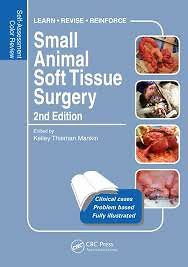 Veterinary students, general practitioners, surgical residents, and specialists with an interest in soft tissue surgery will find Small Animal Soft Tissue Surgery: Self-Assessment Color Review, Second Edition an essential resource.